Jesus the Word is also called Alpha and Omega these details refer to the Word being the source of words meaning Jesus the Word invented languages, Alpha and Omega relates to his being the source of alphabets especially the Greek and Hebrew alphabets used to write the Bible. We wouldn’t know that 3168 is the numeric signature of the Creator if the New Testament hadn’t been written in Greek using an alphabet with each letter also defining a number, and if the spelling had been different the Great Design would have remained unsigned. Therefore the WORD ordained the words of the Greek language and Alpha and Omega invented the Greek alphabet from alpha to omega, and because this alphabet is phonetic the sound of the words as well as their spelling was ordained by the Word, the Greek language is a factor of the Great Design which includes the design of the solar system and even history conformed to the plan of the Great Design. The circumferences of the earth and its moon equal the perimeter of a square placed tangent around the earth this is a simple but profound design, the description was made without using any units of measure. If we change the square’s perimeter into a circle its circumference will perfectly contain great circles of the earth and its moon placed side by side, this is another description without using units of measure. The sun and the moon have the same apparent size which is especially obvious and emphasized when there is a total solar eclipse this is another description of design harmony without the use of units of measure. When appropriate units of measure are introduced to the designs above other layers of design are revealed, the metric system contributes to cognitive dissonance it is not in tune with the cosmos and if we used it in this investigation it hides the things that are revealed by other measuring systems that are in harmony with the cosmos and the things therein such as people for example, the measuring systems we use are not only in tune with us and the cosmos but they are in numeric and mathematic harmony with the numbers of music found on the musical scale chart. In Genesis 1:14 it says about the sun and the moon, let them be for signs, the most spectacular sign concerning these spheres is a solar eclipse, why are they the same apparent or angular size? The moon’s orbit is elliptical so the distance from the earth to the moon varies, at its closest approach to the earth its apparent angular diameter is 33.5167 arcminutes, and at its maximum distance from the earth its apparent angular diameter is 29.367 arcminutes, so about once a week its apparent size is 31.68 arcminutes, the earth’s orbit of the sun is also elliptical and four times per year the apparent size of the sun is also 31.68 arcminutes. 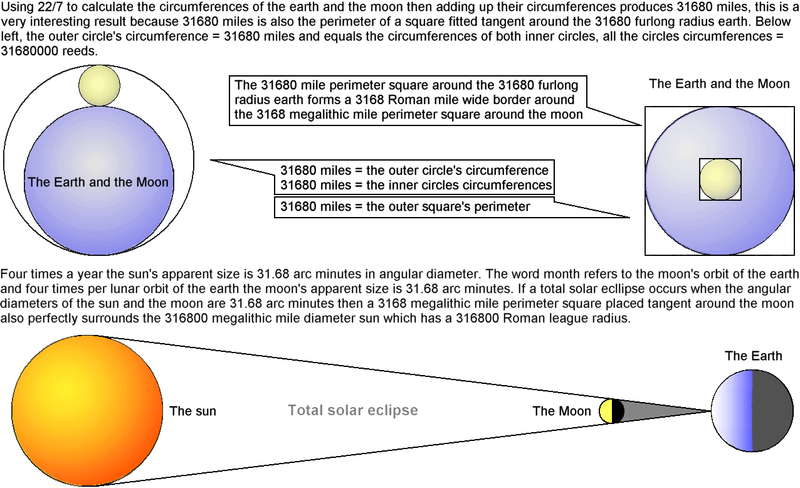 Sometimes the sun and the moon’s angular diameters are 31.68 arcminutes at the same time, if a solar eclipse happens at this time the 31.68 arcminute diameter sun is hidden by the 31.68 arcminute diameter moon and if a square was placed tangent around the moon its 3168 megalithic mile perimeter would also be perfectly surrounding the 316800 megalithic mile diameter sun which has a radius of 316800 Roman leagues. King James Bible 2 Peter 1:16 For we have not followed cunningly devised fables, when we made known unto you the power and coming of our Lord Jesus Christ but were eyewitnesses of his majesty. The Greek word translated majesty is number 3168 in the Greek dictionary of Strong’s Exhaustive Concordance of the Bible, and the Lord Jesus Christ above has a gematria of 3168, it is significant that these two distinctly different examples of the use of the number 3168 are found in the same verse especially because the Greek word listed number 3168 is used only three times in the Bible, Strong’s definition of word number 3168 is shown in bold below. Notice that the word seems to have been purposely designed to describe the Lord Jesus Christ which is how it was used in the original Greek text of the verse above. Superbness, that is, glory or splendour: magnificence, majesty, mighty power. It would be even stranger if the above features of 2 Peter and Strong’s Dictionary were the result of coincidences, but we should not think it gives a blanket approval to all the translations in Strong’s Dictionary, keeping in mind that the dictionary is not scripture and though God may have made a contribution so did man. There are many interesting and varied examples of how the number 3168 is used in the Bible and no doubt there are many more yet to be discovered. 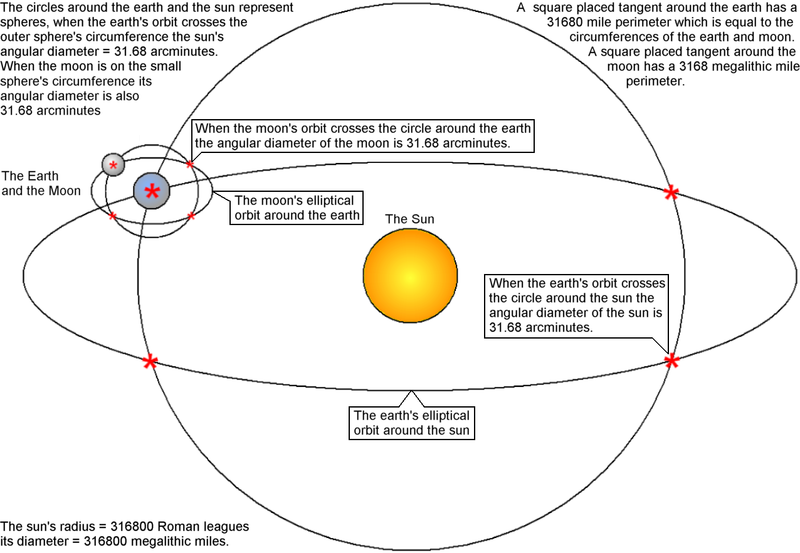 A 31680 mile perimeter square fits tangent around the 31680 furlong radius earth and using 22/7 to calculate the circumferences of the earth and its moon produces a combined total of 31680 miles. Fundamental knowledge of the Bible’s Greek text and the Greek alphabet has revealed to us that the number 3168 is used as the Creator’s numeric signature to sign his work, therefore when we see that a 31680 mile perimeter square fits tangent around the 31680 furlong radius earth it is not just the design of the earth that is signed but also the mile, the furlong and the Greek language are signed. The earth existed before man therefore the above details reveal that the mile, the furlong and the Greek language are factors of the Great Design and were used before man existed. The units of measure used in this investigation have one verifiable source they were ordained by the Creator and we can plainly see that he used them first, and even if we know when, where or how man started to use certain units of measure this gives little or no indication of their real source which is revealed by this investigation. Revelation 22:13. I am Alpha and Omega the beginning and the end, the first and the last. In the beginning God created the heaven and the earth. Genesis 1:1. Those words are the beginning or alpha of the Bible. In the beginning was the Word and the Word was with God and the Word was God. John 1:1 (the beginning of John’s Gospel). Rev. 22:21. The grace of our Lord Jesus Christ be with you all. Amen. (The Bible’s omega verse signed Lord Jesus Christ = 3168). The Word is the Lord Jesus Christ we know this because, The Word was made flesh and dwelt among us John 1:14. We are told in John 1:3. All things were made by him; and without him was not anything made that was made. He is also called Alpha and Omega which means the beginning and the end. In the Bible’s first chapter God created by speaking he spoke and it happened for example Genesis 1:3 And God said, Let there be light; and there was light. So in the beginning the Word was with God and was God, the Word spoke (commanded) and it happened; the Bible’s first four words refer to God the Word who was later made flesh and called the Lord Jesus Christ alias Alpha and Omega. Therefore the Bible’s Alpha and Omega meaning the beginning words and the ending words refer to the Lord Jesus Christ alias the Word who in the beginning was with God and was God, it is also very appropriate and significant that the Omega verse of the Bible is Revelation 22:21 shown above which signs off using the words Lord Jesus Christ which has a gematria of 3168. The subject of the 53rd chapter of Isaiah is the Lord Jesus Christ, the chapter prophecies centuries beforehand of some important details of Jesus’ life, the Crucifixion and his burial, seeing into the future concerning important details are common features of the Bible and they are of course demonstrably supernatural features. The following verse has a gematria of 3168 and it is prophesying about the Crucifixion. Isaiah 53:11. He shall see the travail of his soul, and shall be satisfied; by his knowledge shall my righteous servant justify many; for he shall bear their iniquities. It is very significant that this Old Testament verse written in Hebrew has a gematria of 3168 which is a reference to the gematria of the Lord Jesus Christ written in Greek. This demonstrates that the source already knew many centuries before it happened that the New Testament would be written in Greek, that the main subject would be the Lord Jesus Christ and the gematria of his name would be 3168. Elsewhere in chapter 53 of Isaiah it explains why Jesus came and gives some details of his life and death, the 3168 verse above tells us that the Crucifixion justified many, elsewhere in the chapter it refers to when the Lamb of God was brought before Pilate. Isaiah 53:7. He was oppressed and afflicted yet he opened not his mouth: he is brought as a lamb to the slaughter, and as a sheep before her shearers is dumb, so he opened not his mouth. Compare this prophecy with Mathew 27.13 which is now history. Then said Pilate unto him, Hearest thou not how many things they witness against thee? 14. And he answered him to never a word; insomuch that the governor marvelled greatly.. In Isaiah 42:5 there is another 3168 verse, we leave out the introduction (Thus saith) God the Lord, he that created the heavens and stretched them out; spreading out the earth and its offspring, giving breath to the people on it and spirit to those walking in it. Gematria 3168. The two 3168 verses of Isaiah describe the most important pre historic event concerning man when man’s home was created and we were given life. The other verse is the most important historic event concerning man, for without this event the first event would have been in vain. Both 3168 gematria verses equal a gematria of 6336, man’s home has a 31680 furlong radius and a 63360 furlong diameter.The 3168 verses were revealed to me by Bonnie Gaunt in her book, NILE, The Promise Written in Sand, and I should mention that reading some of Bonnie Gaunt’s books led to my own project, her books supplied the tools for my investigation.